After living in solitude for a few billion years, some formless nameless god no one had ever heard of decided he needed a family. So about 5000 years ago, he reached out. To some guy living in the middle of nowhere. Click here for the PDF of the script. The script is the actual book. It contains a lot more material. You should read it. Really, all the fun stuff is in the footnotes. How odd is it that I’m the one telling this story? I’m not a Jew. I’m not a Christian. And yet here I am. Why me? Why isn’t a Jew or a Christian telling this story? Well, Jews don’t know it. Sorry, Jews, but you really don’t. The story of Hanukkah is told in a couple of Bible books, Macabbees I and Maccabbees II, and neither of these Bible books is in the Tanakh, the Jewish Bible. The only place you can find those two books now is in Catholic Bibles. How weird is that? So if you’re a Jew, and want to read the story of the Macabbees and the re-dedication of the Temple, the basis for one of the most important celebrations in Judaism, that’s what you need to find: a Catholic Bible. I personally guarantee that no Jew you know has ever read either of those books. No Jews even have them in their libraries, except for a few rabbis maybe, and not many of those. Of course no Christian has ever read them either. Nobody knows this story. And anyone who starts looking into it, frankly, starts getting bewildered. Really fast. His (or her) mind starts doing pinwheels. People today just don’t have the Background for it anymore. When it comes to Old Testament history, people these days, if you don’t mind my saying, are a pretty ignorant bunch. So I researched the Maccabees for about 8 years before I first celebrated Hanukkah myself. I thought it would be amusing. Instead, I discovered something truly wonderful. Hanukkah celebrates re-dedication. It celebrates the miraculous potential to start again, to renew your broken vows. It celebrates how the Lord accepts our failures as well as our success, and is ever-ready to bless us as we try anew. You cant imagine how unexpected the Hanukkah miracle was to the Jews 2200 years ago. Theyd totally screwed up. Theyd basically stopped being Jews — some willingly, some unwillingly. The famous miracle of the oil only happened because theyd screwed up so much that theyd allowed their Temple — their only place of worship — to be desecrated. When they finally made up their minds to try to start again, they discovered they didnt have the sacred oil they needed — oil that needed to be prepared in the light of the sacred flame of the Temples menorah. It took eight days to prepare it, and they only had enough for one. Their hopes of starting again were dashed. But somehow — for the first time in their history, actually — the Lord took pity on them. He blessed their desire to re-dedicate themselves, and kept the sacred flame burning. The real miracle isnt the oil. Its that blessing: a fundamental change in our relationship with our Higher Power. That if we even try to crawl to him, the Lord runs to meet us. It was such a fundamental change, such a miraculous change, that the Jews started Hanukkah to share it. Hanukkah isnt meant only for Jews. The lights are lit in darkness and set outside so everyone can share. Unlike any other Jewish holiday, Hanukkah is done in public, so everyone can join in. Its always been that way. Non-Jews have always been encouraged to participate. Thats the whole point really. Hanukkah is an invitation, to everyone, to celebrate the potential for rededication. Even if youre not Jewish, I invite you to join me and celebrate Hanukkah this year. So light a candle with me, and re-promise your broken promises. Rededicate yourself. I spent several years researching its history, and then putting that history into a book, and then (with the help of David Wilcox) an audiobook. Its a great story. The most wonderful story I know, and in the grand tradition of this wonderful fiesta, Im pleased to share all of it for free. You can listen online or download the audio files here. PPS: It would make me so happy if you shared this site. Only time candles are lit after dark, or placed outside. Celebrated continuously and with little change for more nearly 2200 years. 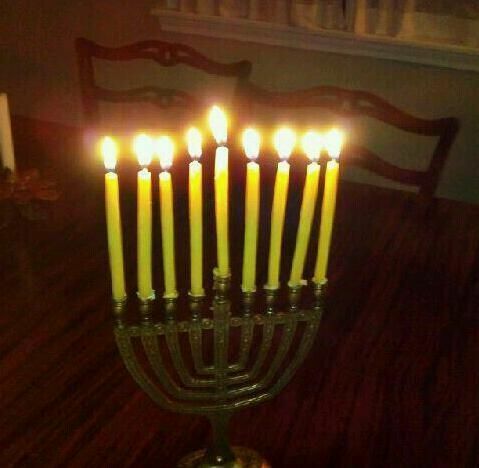 The Talmud states that if unable to afford to purchase both lights for Hanukkah and wine for Passover, that a Jew should buy the Hanukkah lights. The Talmud states that a Jew should sacrifice to buy the lights. Even a Jew receiving charity should buy the lights. “A man should sell his own clothes if need be” to buy the lights of Hanukkah. The reason for this, according to the Talmud, is that the light is meant to be seen by Jews and Gentiles alike. Thats why the lights are supposed to be placed outside, or at least in a window: so all can share the light.